The certainty of movies is that the terrible visions of the innocent can be sourced to a target or ideal. Those that leave the argument open-ended are more inclined to revel in the chaos. What director Philip Ridley did in this case, in a small Canadian film that no one saw and even fewer reference today, is build walls around his subjects that played like the confines of an iron maiden, consistently piercing the defenses of those we observe without seeming to give them the space or strength to contemplate the ordeal. For a picture that was felt more like a harrowing drama than a straight horror film, that was a disquieting impulse. But it’s also not an exploitation of those sentiments, nor is it a celebration of the ensuing violence. This is about the long and silent history of pain, a cycle that people can so drawn to that they unconsciously pass it down like traits in the gene pool, without awareness or foresight to defuse them. And when the suffering arrives in the grasp of a young boy who perpetuates his own mischief, what he sees in the faces of others is not so much despair as it is ambivalence in the daily slog. To him, they are too numbed by their reality to sense the anguish of their impulses, much less the incentive to give them perspective. Not all those who see it will reach the same conclusions. The story deals primarily with a week in the life of young Seth (Jeremy Cooper), a 9-year old boy with too much time on his hands wandering thoughtlessly through one situation after another in search of childish sensations. There is a playful eagerness in his approach that at first seems innocuous; the death of the bullfrog and then the stony views into home life add tinges of sadness to that conviction. This is all he knows of the world: torment, vulnerability, and the absence of dependable figures. His mother Ruth (Sheila Moore) appears manic and detached, and punishes her son in a deplorable manner when he is accused of causing trouble in town. His father Luke (Duncan Fraser) is lost in a mental haze of his own making, and is seen repeating himself as if just accustomed to the formalities of his fatherly obligation. A brother named Cameron (Viggo Mortensen) is referenced off-camera for the first half of the movie, until a tragic series of circumstances lead to the death of their father; when he returns, he has protective strides for his mother and brother but is unsympathetic with their situations, notably because his concerns are overpowered by the affections of a woman with questionable motives. By that point, young Seth has had a number of run-ins with this woman, named Dolphin Blue (Lindsay Duncan), and it escalates his hysteria. The frog prank serves as a conduit for shared angst, a notion that is amplified greatly as the two interact uncomfortably: first in a scene where he goes to apologize for the early prank and hears a haunting story of her deceased husband, and then later when he and his good friend break into her house and vandalize it. For his purpose, Ridley doesn’t gloss these moments up in the underpinnings of dramatic depth or richness; it is more important for him to show these characters (if we dare call them that) in the sluggish movements of a deadening existence, sometimes requiring little from the actors other than blank stares. When Dolphin has an odd moment of sensation while Seth eavesdrops, it is such a strange thing to him that his mind must automatically leap to absurdities, and for the rest of the movie a suspicion develops that this puzzling widow is actually a vampire eager to consume all in her path, including his headstrong (if aloof) older brother. 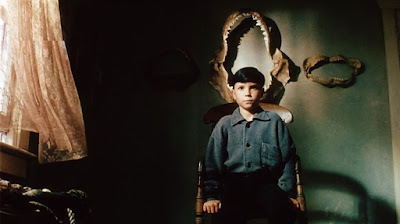 Because the realities of the situations never directly reveal themselves, “The Reflecting Skin” moves with dreamlike confidence through a culvert of hard realities that are unflinching and insufferable, sometimes to the point of personal discomfort. There is no sense of joy or whimsy in the material, no message that validates the misery of its subjects. A great many viewers detest the idea of venturing into the clutches of that much darkness without the fallback of optimism (or at least the promise of relief), and as I watched the movie grow increasingly nihilistic I could sense exactly why it easily faded into the oblivion of the past: few would ever want to dwell in its presence, much less revisit. Yet I was so drawn to the perceptive depth of the narrative that I could not turn away, even as it pressed down on me like the weight of a thousand boulders. Of an array of psychological impulses available at the disposal of the director, he uses them all in their purest incarnation, and because he creates intriguing mysteries in the reliability of the details, it only amplifies the intrigue. We have just as much involvement in piecing together clues of the reality as we do witnessing the tragedy flood the screen. The wonder is that it did not all blow up in the face of its creator, a man who is totally disinterested in the human angle. He is a methodical craftsman content to take the mechanical approach with subjects, all while agonizing over them until all that is left are the guts of the extremes. The performances are modulated well but aren’t emphasized, lest they add unnecessary emotional insight and contradict the story’s cynicism. The most fascinating moments, perhaps, deal directly with the presence of that suspicious black car: it appears often at the sight of tragic circumstances, including the discovery of a young boy’s body in a water tank and the suicide of Seth’s father. Is its presence legitimate, or just a signal that danger looms? When it becomes implicated in two murders later in the film, are the passengers directly responsible, or is Seth simply imagining them to explain all the inexplicable tragedy around him? The fact that nearly all of the characters have first or last names that correlate to animals is a key impulse: certain creatures (like the dolphin and the dove) are avatars of purity, and most often destroyed by the hungry jaws of predators. A single image in the third act essentially wraps this theme in a veneer of blunt visual trauma. When Seth discovers the fetus of a young child hidden in a box, he adopts it as if it were a stuffed animal. There is a stellar overhead shot that shows him and the deceased infant huddled together as if in contemplation; this has become his guardian angel, the outlet which he confides all the terrible things he has seen. How did Ridley have such nerve to use such a moment without reducing it to a crude act of sensationalism? The moment is as sad as it is disquieting, and certainly the dialogue reflects the fierceness of the conviction. This is no longer a boy but an unfortunate witness to a slaughter, whose first-hand accounts have so altered his perceptions that he can no longer separate pain from sensation, illusion from reality, or hope from acceptance. It changes the way he views the world, and more importantly leaves the film’s audience with a moment that plays like a defining visual statement. A life is scarcely worth living if the goal becomes to escape the consumption of a relentless menace day after day.